Accommodation in Monte da Fornalha. Monte da Fornalha was once the rural house of the local Blacksmith. It has been carefully restored with great attention being paid to all details, resulting in a beautiful house ideal for those wanting to explore the area due to its strategic position. The property is located between the city of Estremoz and the village of Borba, approximately 175 kilometres from Lisbon and 40 kilometres from Spain. Estremoz is in the very centre of the prolific marble-quarry region of the Alentejo. Surrounded by 17th-century fortifications this town was one of the most important fortifications in the country and the influence of other cultures is reflected in the battlements which have a Moorish feel. Borba is noted for its white marble and fruity wines. The locally produced wine is considered to be one of the best in the country. Monte da Fornalha has a total of five tastefully decorated bedrooms, each one unique in its character. Two bedrooms are double bedded and three can be either double or twin. All of them have large ensuite bathrooms and central heating. Two bedrooms are junior suites. Another one is a suite located on the first floor which has a private terrace. The large sitting/dining room has two traditional Alentejana fire-places and offers comfortable seating areas. The buffet breakfast is served in the salon. It may also be taken in the garden, under the trees or on the terraces. Outside there is a terrace with garden furniture and a barbecue area. 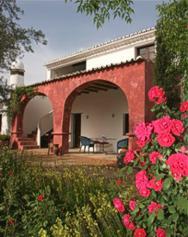 The swimming pool is set in the mature garden with lawn and fruit trees, surrounded by olive groves for natural shade. There are various activities available in the surrounding area such as horseriding, golf, hiking and bird-watching. Monte da Fornalha has an 'honesty' bar. During spring and summer months light meals / snacks are available from 2pm to 4pm. Dinner service is not available but there is great offer of good restaurants in the nearby villages (meals can be delivered at Monte da Fornalha).